So, it’s time to give your bundle of joy the comfort he deserves throughout his 16 hours of sleeping time (newborn babies usually sleep an average of 5 hours during the day, and 9 during the night). One way you can ensure your baby is comfortable, safe, and nearby while he or she sleeps is by choosing the very best bassinet. We made this list by bringing together the 10 top-ranked bassinets and having 8 moms execute a hands-on review of them. After that, we ranked them and came up with a list of favorites. This is an all-in-one bedside bassinet with a lot of useful features, though it is also one of the more expensive bassinets on our list. You’ll be getting your money’s worth though, as this bassinet has been built to last with quality craftsmanship and materials. You can easily adjust it to fit your bed height because it has an adjustable base, making it suitable for all beds. We all loved it during the trial period as we found it to be sturdy and durable. The feet fit perfectly underneath any bed or sofa. 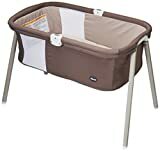 As an example of how useful this can be, one of the moms who liked it (she had undergone a C-section) said that it meant she could just lie down on her sofa or bed and the bassinet would adjust to perfectly fit either of those – meaning she didn’t have to get up in order to access her baby. The bassinet’s sidewalls can be easily lowered, thus keeping your baby on the same level as yourself. This makes it easier to lift your baby out even after a difficult birth or C-section. The bassinet is able to rotate and it swivels to bring your little one around to where you are lying. The mesh ventilation sides ensure your baby stays safe from suffocation and it also enables you to easily see the baby. Little wonder it’s been certified by the CJ Foundation as the best and lowest-risk alternative to bed-sharing, as it’s highly effective in SIDS risk reduction. The only non-satisfactory feature we noticed is the mattress’s comfort level. The mattress is quite thin compared to most of the competitors’. Of course, firm mattresses are highly recommended for newborns owing to the crucial role they play in SIDS risk reduction. Another issue came up when it came to leveling the bed horizontally after adjustments, though this is a problem only at first. You can also purchase the Luxe Plus model that will cost you quite a bit more than the original, but it includes a couple extra features to help your baby sleep, mostly in the form of a handy electronic addition. The music module includes a couple lullabies and soothing ambiance sounds, a floor light, and soothing vibrations to give your little one a perfect sleep – day and night. The feeding timer also alerts you when it’s time to feed your baby. In our opinion, and that of the mom and dad testers, this is the best, most beautiful, and most stylish bassinet on the list as it will fit in with the other modern furniture in your home. BabyBjorn doesn’t rely on a bunch of moving parts and electronics to ensure calming sleep to the baby, instead, it operates through more natural means – a lightweight suspension system that responds to any motion made by your kid. It basically rocks when the baby moves and you can also do the rocking yourself. The breathable mesh sides keep your baby safe from excess heat and suffocation. The bassinet is manufactured with safe, tested materials, giving you as a parent peace of mind. In our tests, this bassinet proved to be the best alternative to the co-sleeper. It’s an excellent bedside bassinet, even though it’s height cannot be changed. The BabyBjorn bassinet fits perfectly right up against a normal height adult bedside. Just slide the legs under the bed. It also has a removable canopy. The mattress, which is made of polyurethane supported by an MDF board, is truly comfortable yet also supportive. The fabric surrounding the cradle ensures your baby won’t bump up against the sides of the bassinet and allows you to see your baby through the sides. 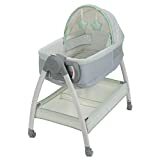 The only aspects of this bassinet that some may find negative are its simplicity and its very high price, which are two things that don’t go well together for a lot of people. Still, as quality goes, this cradle is as good as they come. This bassinet is lightweight and easy to transport, making it one of the best cradle options out there for parents and babies who are always on the go. It comes with a carry bag that can be easily carried over your shoulder and put into the car’s trunk or taken as airplane luggage on your family trips. We were greatly impressed by the bassinet’s light and airy nature. It’s made of soft and easy-to-clean fabric which is removable for machine wash purposes or can be wiped down with a cloth. The side mesh windows allow for good ventilation while also enabling parents to keep an eye on their little one. If you want to use it as a fixed bassinet in your baby’s room, simply unfold the basket and snap the legs on. The mattress is quite similar to the BabyBjorn one except that it’s a bit thinner, which is perfect for a lightweight travel bassinet. We compared the bassinet’s stability on a carpet and on a hardwood floor and found out that it’s more stable on a carpet. It does have anti-slip feet for when on the floor. Despite having similar features to the BabyBjorn (almost same-size basket, and similar comfort), this bassinet seems less stylish than the BabyBjorn. However, this matches its low price (which is about a third of the BabyBjorn’s). It’s spacious enough too, owing to the fact that the bottom part hangs down to allow your baby to kick and roll around. It’s a bit larger than we expected, and at 3 feet long, it’s a sizeable travel bassinet. Disadvantages? The slightly swaying bottom could be a problem if your little one is wiggly because the bassinet may move more than you’d like. It is not like a glide bassinet or rocking bassinet, but it does move a little. Another disadvantage is that the included sheets are rough, thin and not waterproof, so the mattress pad may become soiled. However, replacements are available from Amazon. The mattress comfort and quality are good. Generally, this is the best deal if you need a practical bassinet that is fit for traveling. If you want a fancier one with more features, the Babyhome Air Bassinet and Babyhome Dream Bassinet will serve you well. 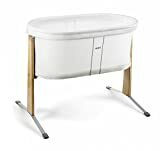 This is a very versatile bassinet option with a better price than most others. Its features are well executed and useful, making it a desirable product. The primary thing to highlight about the Graco Dream Suite bassinet is that it doubles as a changing table. It has a distinctive system – you hold its handle on the side, squeeze it, and then flip the entire bassinet over to reveal a changing table. This is an impressive feature that makes it more convenient than changing a diaper directly in the bassinet. The changing table can be safely used for babies weighing up to 30 pounds, which is usually true for toddlers for up to about 20 months old. The bassinet is suitable for babies up to 15 pounds, so the table will outlast it. From our research, we concluded that the flip feature is a very useful addition as it helped parents save time and space. The only disappointment about it is that for the bassinet to flip over you need to use two hands. While it is safer if the baby’s older sibling is curious, it may be a bit irritating to have to put the baby down in order to pull out the changing table. Apart from these minor drawbacks, it is a great bassinet. The materials are soft and easy to clean, not to mention the product is well built and sturdy. Additionally, the storage space at the bottom is convenient to use for wipes, diapers or extra linen. The bassinet’s locking wheels make it safe and portable. Another key feature is that it locks into place and hence it’s not a glide or rocking bassinet. The Graco Dream Suite bassinet has two comfy vibration settings. The firm mattress is ideal for a newborn. It has a cute canopy with a star motif that’s perfect for boys. There’s a flowered one for girls. The Graco brand has mesh sides that provide good ventilation. The package comes with one sheet, and assembly takes around 10 minutes. Altogether, it’s an outstanding option! This bassinet is a very good choice if you’re looking for a more classic design that doesn’t compromise on features. The Classic Comfort comes with an adjustable canopy to increase the baby’s comfort when sleeping. A music module is also included with this bassinet, which offers 4 different soothing melodies, 3 types of calming nature ambiance, as well as a vibration feature. The bassinet itself, while not perfect or adjustable in height, will do fine as a bedside cradle. The lockable wheels help with mobility, at least around the house, while the spacious storage basket at the bottom makes moving around even more convenient. As mentioned before, the design of the bassinet is quite fancy, making up for the lack of portability. It is made out of solid wood, adding to the exquisite appearance. The Classic Comfort comes with a padded mattress and a fitted, machine washable sheet, which will do just fine for any baby. The main downside with this crib is that it’s not very breathable since its sides are covered with relatively thick fabric, so be more mindful to not leave this bassinet in hot areas. Considering the number of features and the customer-approved quality, it’s priced very reasonably, at a noticeably lower price than similarly equipped bassinets. This is bound to be a winner if a co-sleeper bassinet is just what you’ve been looking for. In short, a co-sleeper is a bassinet with one or both sides being openable, allowing for the parents and the baby to see each other as they sleep. Although they are very popular, co-sleepers can be hard to locate, as stocks are limited. Also, co-sleeper bassinets like the Cambria are generally pricier than other models. Sleeping in the same bed with your newborn is such an intimate experience for a mom. However, due to the risk of suffocation as well as SIDS, a high number of pediatricians do not recommend it. Bassinets like Arm’s Reach offer a safer alternative. They’re also great for moms who have had C-sections and have restricted movement. The bassinet is pushed right up against your bed, so baby is well within reach. To have a bassinet against your bedside gives you and baby security and comfort which is essential to help you lull your baby to sleep. This bassinet has side mesh walls, which allow for good ventilation. The mattress is thin and firm, as is recommended for newborns. The sides are easy to raise and lower. Whenever you want to feed your baby, you just lower the side to reach him and raise it after you are through with feeding. The Cambria bassinet has adjustable legs to suit higher or lower beds, and a strap to put under the mattress to keep it close. The wheels can also lock. There’s a handy storage basket on the bottom too for linen or baby supplies. In general, this is an excellent, safe and attractive bedside bassinet that has a co-sleeper option. Its price may be a bit high for some, and it’s occasionally out of stock making it a little difficult to source at times. This bassinet is a great option if you are looking for something portable yet still comfortable for your baby. It’s a winner when traveling as it folds up easily and can fit into a suitcase. It is absolutely great for newborns as it is comfortable and stable. Measuring about 22 x 23 x 9 inches the bassinet is large enough for your baby to have adequate space to move around in. Once your baby is a bit older, it easily doubles up as a play yard so you can leave him in it and he’ll be perfectly fine. The mattress on the bassinet is soft yet firm and it is surrounded by mesh to allow good air circulation. It is a rocking bassinet so if you don’t want to get up from your bed, you can easily reach out and rock him back to sleep so you can also get some rest. The product comes in beautiful low-toned patterns that will match with most nursery décor. Some cons include the fact that it doesn’t have a storage compartment under it like most bassinets do. It may also be a bit too deep for you to easily reach in to pick the baby if you are in your bed. You may also find it difficult to find the right sized fitted sheets for the mattress. This pretty bassinet has a very sweet traditional look to it with a canopy and ruffled liner but it is still modern enough for any new mom. 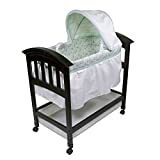 This bassinet is a favorite amongst many parents since it has everything you need including a storage compartment at the bottom, lockable wheels for easy movement and even a music box and a night light to lull your baby to sleep. It measures 33 x 17 x 45 inches—just good enough to accommodate your child up to about 15 pounds. The mattress is firm yet comfortable. The bassinet is not adjustable but is about the same height as most beds so you can easily reach over to pick up and put down your baby as needed. Many reviewers found it quite easy to assemble since it comes with simple instructions so you shouldn’t have any problem with that. The fabric on the bassinet is machine washable and cleans easily. It comes in soft, neutral colors suitable for any gender. A disadvantage is a fact that the storage area at the bottom isn’t very sturdy so it wouldn’t suffice for anything heavy. Another appealing property of this bassinet is its price – one of, if not the lowest prices for such a well-equipped bassinet. This is a worthy investment option for new moms as not only will you use it in the early years but also as your baby grows bigger. The Pack ‘n Play comes with a changer, which is really helpful when you need to change your baby at night. It easily converts back into a bassinet in an instant. It is cozy and comfortable, surrounded by a mesh with a soft mattress that allows your baby to sleep comfortably during the day and night. The Graco has a toy bar with some toys to keep your baby busy, a storage compartment on the side to put in anything you need and a push-button mechanism for quick and easy packing up of the play yard for travel. 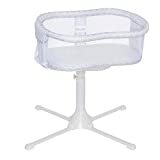 You can use the bassinet for babies up to 15 pounds and once they can move around, you can remove the bassinet to create a safe and spacious space for them to play in. Some negatives of this bassinet are that the changer is quite low so you may have to bend when changing the baby. The cover of the bassinet is non-removable so you cannot remove it to put it in the washer, but it can be wiped down with a cloth. This is yet another classic-style bassinet with a reasonable price tag on it. It has a really attractive vintage style that is perfect for most nurseries. It’s big enough to support a baby of up to 15 pounds and is very sturdy. Some interesting features of this model include that it has removable wheels for moving your baby around easily and has a well-functioning music box with a night light as well. It also has a large storage basket underneath to store all the baby’s supplies. The mattress on the unit is soft and comfortable, yet firm. A big plus is that it comes supplied with a fitted sheet, so you won’t have to struggle to find one to fit. The bassinet is easy to assemble so you shouldn’t have any problem with that. A downside for this one is that although it says you can turn the bassinet at an incline, it is not the easiest setup so it may take you a while to do that every time. Though this is a minor downside, making this bassinet a pretty good product all-around. A great bassinet is a crucial part of your baby gear. 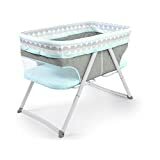 In case you’re new to parenting and you don’t know this yet – you’ll be spending most of your time trying to get your baby to sleep, especially in the first year, so a comfortable bassinet will go a long way towards offering you some well-deserved rest while your baby peacefully sleeps and grows. The main factors to take into consideration when looking for a bassinet are breathable case materials, ease of access to the baby, and mobility. Extra features like music boxes, canopies, and nightlights are pretty handy too. Most bassinets in our list have crucial differences between one another, making all of them viable options, depending on your personal choices. Still, there are some standouts for most parents. The Halo Swivel Sleeper definitely stands out as the best all-around choice by being simple yet very functional at a reasonable price. The Chicco LullaGo would be the best for parents who travel a lot, while the Delta Children Sweet Beginnings is the best budget choice, with all the regular features but at a much lower price. A good bassinet can be considered a necessity, right from birth until your baby is old enough to walk. Some parents do not see the need for one, but they do come in handy when you don’t want to keep waking up to go check on your baby at night. Moving a crib around is inconvenient, so bassinets are a good option that allows you to have your baby close to you wherever you are around. Ensure you look for functionality and safety above all else so that you won’t have something that looks good but doesn’t perform well. Good luck, and sleep well!